PageMaker was one of the first desktop publishing programs, introduced in 1985 by Aldus, initially for the Apple Macintosh and, in 1987, for PCs running Windows 1.0. As an application relying on a graphical user interface, PageMaker helped to popularize the Macintosh platform and the Windows environment. PageMaker relies on Adobe Systems' PostScript page description language. 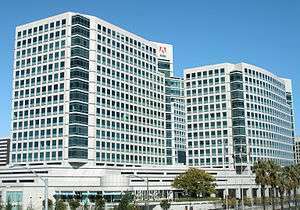 In 1994, Adobe Systems acquired Aldus and PageMaker. Aldus Pagemaker 1.0 was released in July 1985 for the Macintosh and in December 1986 for the IBM PC. Aldus Pagemaker 1.2 for Macintosh was released in 1986 and added support for PostScript fonts built into LaserWriter Plus or downloaded to the memory of other output devices. PageMaker was awarded an SPA Excellence in Software Award for Best New Use of a Computer in 1986. In October 1986, a version of Pagemaker was made available for Hewlett-Packard's HP Vectra computers. In 1987, Pagemaker was available on Digital Equipment's VAXstation computers. Aldus Pagemaker 2 was released in 1987. Until May 1987, the initial Windows release was bundled with a full version of Windows 1.0.3; after that date, a "Windows-runtime" with no task-switching capabilities was included. Thus, users who did not have Windows could run the application from MS-DOS. Aldus PageMaker 4 for Macintosh was released in 1990 and offered new word-processing capabilities, expanded typographic controls, and enhanced features for handling long documents. A version for the PC was available by 1991. Aldus PageMaker 5.0 was released in January 1993. Adobe PageMaker 6.0 was released in 1995. Adobe PageMaker 6.5 was released in 1996. Support for versions 4.0, 5.0, 6.0, and 6.5 is no longer offered through the official Adobe support system. Due to Aldus' use of closed, proprietary data formats, this poses substantial problems for users who have works authored in these legacy versions. The final version made available is PageMaker 7.0, released 9 July 2001, though updates have been released for the two supported platforms since. The Macintosh version runs only in Mac OS 9 or earlier; there is no native support for Mac OS X, and it does not run on Intel-based Macs without SheepShaver. It does not run well under Classic, and Adobe recommends that customers use an older Macintosh capable of booting into Mac OS 9. The Windows version supports Windows XP, but according to Adobe, "PageMaker 7.x does not install or run on Windows Vista." ↑ Adams, Peter (16 March 2004). "PageMaker Past, Present, and Future". Archived from the original on 9 July 2007. Retrieved 27 June 2007. ↑ "Aldus Now Shipping Pagemaker for IBM PC". InfoWorld. 9 (6). 1987. ↑ Benj Edwards (3 May 2013). "Born Apple: Six famous Windows apps that debuted on the Mac". Macworld. ↑ Pamela Pfiffner (11 September 2007). "Opinion: Adobe's world". Macworld. ↑ Keith Thompson: Pagemaker remains Chief Composer. In: InfoWorld Volume 8, Issue 23, 9 June 1986. ISSN 0199-6649. Pages 39–40. ↑ Ken Freeze: Flexibility for PC Pros is Page Layout Strength. In: InfoWorld Volume 9, No. 12, 23 March 1987. ISSN 0199-6649. Pages 42-44. - Review of PageMaker for the PC. Remarks about the Windows-bundle on p. 43, first column. ↑ Michael J. Miller: First Look. In: InfoWorld Volume 9, Issue 9, 2 March 1987. ISSN 0199-6649. - Short comparison of PageMaker, Ventura Publisher and Harvard Professional Publisher, a modified version of Superpage by Bestinfo. ↑ Aldus Corp. Ships PageMaker 3.0 for the Macintosh. BusinessWire, 24 March 1988. ↑ Aldus Ships PC Version of PageMaker 3.0. Businesswire, 19 May 1988. ↑ The precise Windows version required was 2.03, which is the exact version number of the first publicly available Windows 2 release. cf. Windows Version History. Microsoft Knowledge Base, Document No. 32905. Last access date 22 July 2010. ↑ Stuart J. Johnston: Pagemaker 3.0 Adds Support for Style Sheets. In: InfoWorld, Volume 10, Issue 22, 30 May 1988, page 20. ↑ "PageMaker 7 System requirements". Adobe. Archived from the original on 3 July 2007. Retrieved 27 June 2007. ↑ "How Adobe Products Support Windows Vista" (PDF). Adobe. 12 February 2007. Retrieved 27 June 2009. ↑ Matthew Honan (1 June 2001). "Is 7 PageMaker's Lucky Number?". Macworld. ↑ Ann Marsh (31 May 1999). "Pride goeth before destruction". Forbes. Retrieved 5 February 2013. ↑ Gretchen Peck (September 2004). 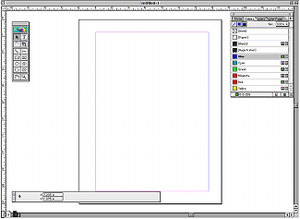 "QuarkXPress versus Adobe InDesign". Digital Output. ↑ Galen Gruman (17 May 2004). "Adobe PageMaker Plug-in Pack". Macworld. ↑ Jim Dalrymple (5 January 2004). "Adobe discontinues PageMaker dev, offers plug-ins for InDesign". Macworld. ↑ "FAQ for Adobe PageMaker Users" (PDF). Adobe. 2005. Retrieved 6 March 2014. ↑ "InDesign CS2 Frequently Asked Questions" (PDF). Adobe. Retrieved 27 June 2007.